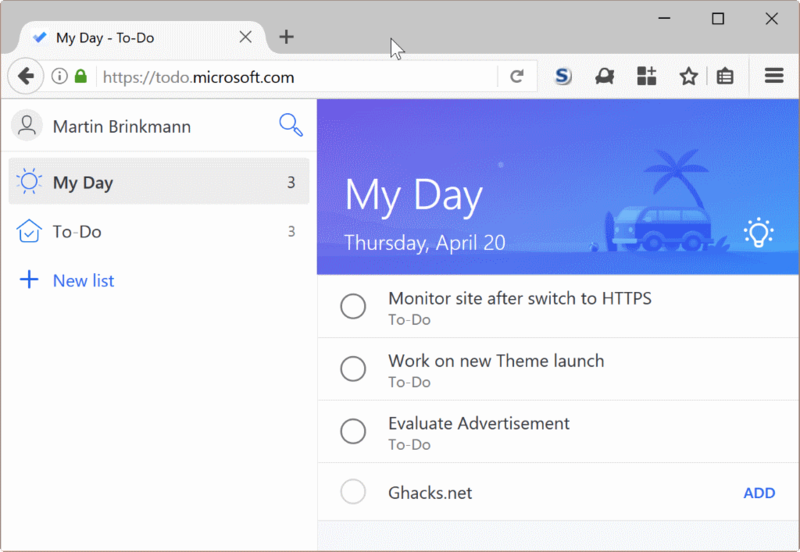 Microsoft launched a preview of To-Do, a new cross-platform task management service the other day that is "designed to make it easy to plan and manage your day". My first reaction to the announcement was meh, another task management service. Did not Microsoft buy Wunderlist a couple of years ago exactly for that purpose? Wunderlist was hailed by many as the coming king of task management apps, but things went quiet after Microsoft's acquisition of the service. Yes, the team released a Windows application version, but did not introduce new features in recent time. The blog post on the Office blog reveals the main reason why that was the case. The team that is responsible for Wunderlist, which became a part of Microsoft after the acquisition, has been working on the new task management service To-Do for some time now. Known as Project Cheshire before, it is now available as a Preview on the Web, and as applications for Android, iOS and Windows 10. To-Do comes from the team behind the Wunderlist app, and delivers a smarter, more personal and intuitive way to help people stay organized and get the most out of every day. Powered by Office 365 integration and an intelligent algorithm, it is the first step on our journey to simplify task management and help you achieve more. The To-Do preview is rather bare bones right now. You need a Microsoft Account to get started, and can use the service on the Web, or on Android, iOS and Windows 10 devices in app-form. You can use the service to add to-dos, and create lists to sort tasks by topic. You may set due dates, add notes, and reminders on top of that using the service. Microsoft To-Do ships with a suggestions feature which highlights important tasks to you which you may want to focus on. It is too early to tell how well this works though. This is the main functionality that Wunderlist offers as well, but without options to add file attachments, or work on tasks in teams. Another interesting feature of To-Do is its integration with Office 365. The service syncs automatically with Outlook, and you will find your Outlook Tasks in To-Do right away provided that you use the same account for both services. Microsoft plans to bring "more favorite elements of Wunderlist into the To-Do experience", and mentons list sharing, apps for Mac, iPad and Android tables, and additional integration with Microsoft services specifically. The company plans to retire Wunderlist eventually once it has "incorporated the best of Wunderlist into To-Do". To-Do users may use the import tool to bring Wunderlist or Todoist lists and to-dos to Microsoft To-Do. Pretty-looking and that’s it for the moment. Very basic functionality – no contexts, tags, projects, sub-tasks etc. Just lists and list items… Close to WL philosophy, but far from Toodledo, Todoist etc. You need to do more, MS! Pretty-looking? Beauty is most certainly in the eye of the beholder. I will be so glad when they finally ditch the Win10 theme for something else. Of course, you need to sign in. Why wouldn’t you want Microsoft to know what you are doing by the minute, I wonder ? No way to use it without Microsoft snooping on everything you’re planning. Shame that. It’s not so much MS but their “partners” trying to “enhance” our web experience. The OS is just a vacuum cleaner for collecting info. Keep an eye on gov’t and business response to privacy down the road. They are going to degrade and most likely criminalize privacy advocates by marginalizing, isolating and legislating their activities. No surprise that you have to sign in to get full functionally. “Every breath you take, every move you make, I’ll be watching you”. That’s about stalking and spying as well. Time to use pen and paper to make a “things to do” task list. Anything from Microsoft has a free one-way ticket for garbage, here. It is too simplistic. Google Keep is so much better and more useful IMO. Great, they already capture everything you do in Windows; now they want to capture everything you are planning to do beforehand. The swingers on these bastards. I will always use a pocket sized notebook and pen to take notes and create to-do lists. Relying on software to think and plan seems strange to me. I’m a simple caveman. I cannot use Microsoft To-Do. It does not support Sub Tasks. I never understood the logic behind buying 6Wunderkinder, folding Wunderlist and trying to move users to a Microsoft work-in-progress clone of something that was already up, running, popular, successful and among best-of-class. I would have built on the userbase and popularity of Wunderlist and added features like Office connectivity to it rather than trying to reinvent the wheel the MS way…. As a longtime Wunderlist Pro user I tried To-Do early on. IMHO it’ll take time for it to be a good replacement. Too bad….